Attic Ladder (Wooden Fire Rated) LWF 25x54 300 lbs 10 ft 1 in High quality with attention to details, the ANSI approved LWF fire-rated attic ladder is made from quality pinewood assembled in three sections. LWF fire-rated attic ladder provides easy access to the attic while functioning as a blaze block in case of fire. The hatch is manufactured with the use of fireproof materials and is equipped with a gasket that expands under extreme heat. The LWF attic ladder is fire resistant at EI230 minutes as per EN 13501-2. LWF is equipped with locking mechanism that is installed inside insulated and sealed door panel. Length of ladder may be adjusted within 1 after cutting the side rails to set ladder evenly on floor. Construction of ladder provides more steps (tread rise about 10 in.) to improve safety and comfort. A red, metal handrail is included and may be installed on either side of the ladder. Door opens and closes easily (NO sudden movements). Fits rough opening 25 in. x 54 in. and ceiling heights 7 ft. 11 in. to 10 ft. 1 in. 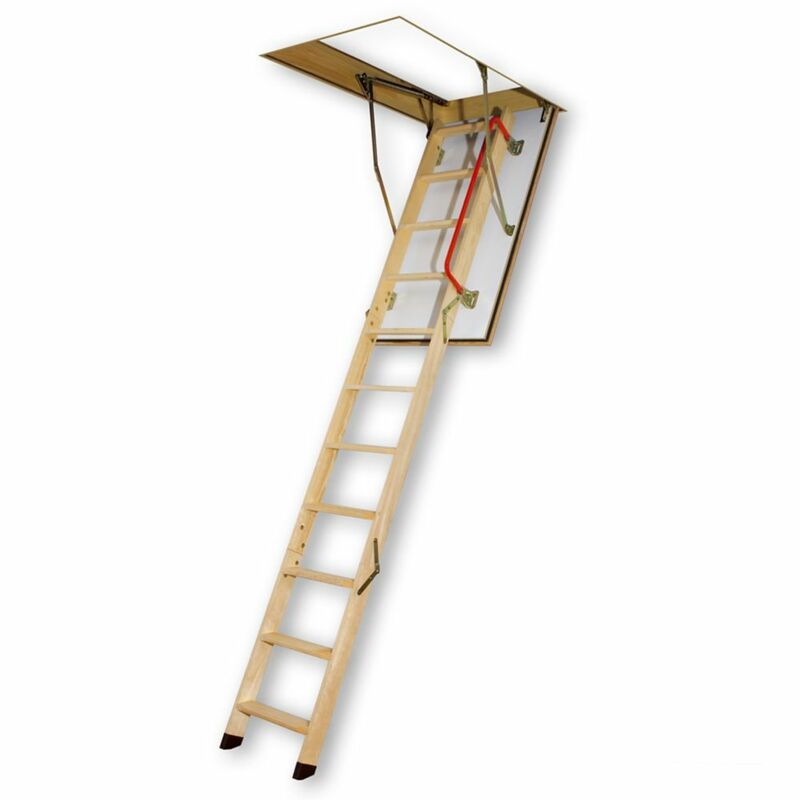 Attic Ladder (Wooden Fire Rated) LWF 25x54 300 lbs 10 ft 1 in is rated 3.7 out of 5 by 3. Rated 1 out of 5 by Brad from arrived broken, very poorly made, such a disappointment The outer frame is stapled together with two or three staples per corner. The manufacturer apparently did nothing to clamp the corners together as the glue they did use was not holding anything together either. All four corners were either completely apart or coming apart. The side of the outer frame where the hinge attaches was split so the hinge itself was not properly located. I was able to use some angled metal corner brackets, and a metal plate for repairing broken framing, along with some very short screws and a lot more glue to get the frame approximately square and repair the frame where the hinge attaches. Hopefully it holds together. The repair parts cost me over $50.00 and I had to wait a day for the glue to dry which meant I had to reschedule my assistant and that meant paying him twice. FYI - the ladder itself is the same narrow ladder that comes with the smaller attic hatches. Rated 5 out of 5 by ginjin1 from Sturdy and easy to use I am very satisfied with this product. It is of good quality and very sturdy. It is also very easy to use. Rated 5 out of 5 by JimVaBch from Exactly what I needed This fireproof attic ladder is exactly what I needed. I had a construction grade attic ladder that was simply falling apart after 30 years. The existing ladder was letting attic heat into the laundry room, was not adequate to support my weight (225) and was not fire resistant. This ladder solves all three problems. Two notes - the Fedex Ground delivery service will not call ahead of delivery, and you or your installer will need loose fire proof insulation to insert between the door package and the legacy hole in the attic floor. Shims are provided, but not insulation to stuff into the space.